YouTube -- a website that allows people to upload short, original videos to be accessed by others -- was founded less than six years ago but gets more than 2 billion views per day. There were much earlier versions of video sharing venues, though. In fact, they began around the turn-of-the-century. They were called Silent Movies....and The Congregational Church of Mansfield has brought them back. John Read, Director of Church Music, explained: "I had played a couple of silent movie nights at one of my previous parishes in Pennsylvania. Then a few years later when I started at Mansfield, Liisa Niemi -- one of our choir members -- told me how much she was into silent movies. That's how we hit on the idea of silent movie nights. We ran it by a few people at the church and they were enthused. So we ran with it." Dating back to the turn of the century, showings of silent films almost always featured live music, which gave the audience emotional cues and an atmosphere of comedy, mystery, romance or tragedy, depending upon the music played. Read has carried on that tradition. "In terms of the music, more often than not I am viewing the movie for the first time. My accompaniment is entirely extemporaneous except for certain moments Liisa alerts me to ahead of time, like playing "O Promise Me" under a big wedding scene in the film Sunrise." But how does Read come up with these titles so quickly and handily? "I am fortunate to have a repertoire of hundreds of standard tunes, theme songs and jingles in my head that suggest themselves along the way," he explained. "For instance, a horse comes on and I play the 'Mister Ed' theme...a head falls off a statuette so I do 'You Go To My Head"...a guy gets shaved with hot lather in a barber shop so I come up with the 'Gillette Cavalcade of Sports' tune. It's limitless." "It's fun for all ages," says Read. "Not to mention a low-pressure awareness-builder for our church." Niemi -- who offers movies from her vast collection -- gets decked out in vintage 20s "flapper" outfits, introduces the featured film, and provides anecdotes about the genre in general. Carol Ham, another choir member, takes the pains to make old-fashioned popcorn from scratch. The familiar movie theater aroma adds immeasurably to the atmosphere. The church provides soft drinks, stations someone at the door to take the cash, and sets up the laptop and projector. Volunteers hang flyers, send out emails, and notify the local press contacts in order to get the word out. "Compared to other church events," Read says, "preparation for silent movie nights is minimal." The church requests a $5 donation from attendees, with the money raised going toward the general fund. About 30 usually attend, but the event has been growing in popularity. Many attendees have commented that it is a charming throwback to slower, pre-Facebook days. 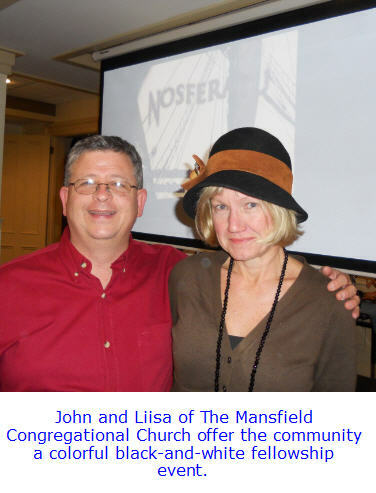 Thanks to church members who have a passion for vintage items, piano playing, and old flicks, Silent Movie Night at The Mansfield Congregational Church has become a classic.